The Military and Veterans Law Institute is a premiere research and academic Institute. The Institute also has a legal clinic, which provides pro bono representation to military personnel and Veterans. The clinic provides legal representation on issues ranging from Discharge Upgrades, Traumatic Service Group Life Insurance Appeals, VA Benefits Appeals, and issues arising under the Service Members Civil Relief Act. It has recovered millions of dollars in benefits, judgments and settlements for its clients. The Military and Veterans Law Institute faculty, which rank among the top military law experts in the country, not only engage in scholarly research and writing, but also pursue high-profile litigation on behalf of military members and veterans. Institute Faculty are the go-to experts for everything Military and Veterans Law Related. They have testified before Congress on issues ranging from Military Voting, to Guantanamo Bay, to personnel issues impacting Military members. They also regularly appear on national and internationally syndicated television and radio programs, and regularly publish opinion pieces in publications such as the Wall Street Journal and the Chicago Tribune. The Institute’s founder and Executive Director, Professor Kyndra Rotunda, has published two textbooks, and a third book geared towards practicing lawyers. Her first book, Honor Bound: Inside the Guantanamo Trials (Carolina Academic Press, June 2008), was followed by her textbook, Military and Veterans Law (Thomson/West Publishing, 2011. It is the first textbook of its kind, geared to the growing number of Military and Veterans Legal Clinics in the country. Rotunda's third book, geared toward practicing lawyers and scholars, is entitled Civil Protections and Remedies for Veterans and Servicemembers (Thomson Reuters, July 2017). The Military and Veterans Law Institute offers competitive experiential Fellowships, which are open to qualified, competitively selected, 2L, 3L and LL.M students. Fellows who are offered positions will received a stipend from Chapman University. Fellows are typically selected at the end of the Spring and Fall Semesters. Interested candidates should contact Professor Rotunda, by email, for additional information about the application process. 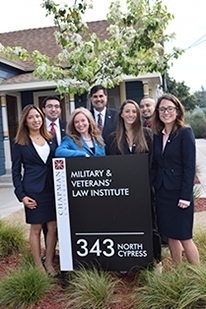 The Military and Veterans Law Institute is located on the Chapman University Campus, and housed at 343 N Cypress, Orange, CA. For all inquiries please contact, Charles Cussalli, the Military and Veterans Law Institute Administrative Assistant, at (714) 628-2692. View the latest blog posts from the Military and Veterans Law Institute.